API 5L Grade X52 pipe is produced Welded & Seamless both, The most common welded pipe in X52 is ERW Pipe, before buying this material buyer must know about api 5l x52 pipe wall thickness, dimensions, chemical composition, pressure rating, schedule and weight chart. 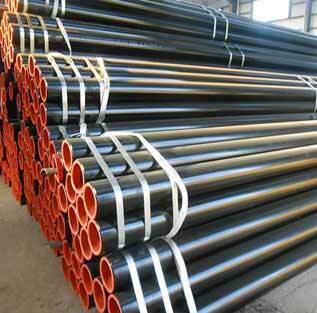 API 5L X52 pipe ISO standard is ISO 3183, Grade: X52 or L390 (N, Q, M, R) comes in PSL1 and PSL2 specification. L390 Seamless pipe out diameter (OD) is available in stock from 21.3mm - 660mm and in Inch 1/2" - 26". In grade X52 ERW and HFW Pipe produced in OD 1/2" - 24". 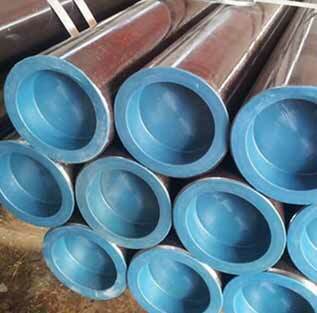 We also supply API 5l X52 LSAW and SSAW Pipe in OD: 16" - 100 inch. This Steel Pipe comes in Schedule 10, SCH40, SCH 80 & SCH 160. Standard pipe Length is : 5m to 12m, In X52 Pipe Ends are available in types like Plain, bevelled Ends and Threaded Ends. 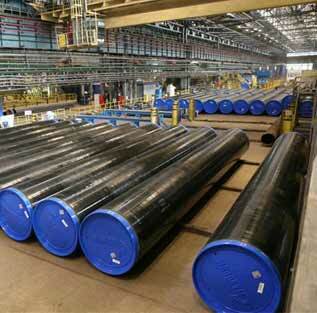 Steel Tubes India also provide Internal & External Coating on steel pipes and tubular products. As per requirement of our customer we offer Black paint, Varnished, FBE coating, 3PE Coating X52 Seamless pipe and all lined pipe. STI has ready stock of around 100 ton of API 5L X52 steel pipe in PSL1 and PSL2. L360 pipe from most reputed manufacturers of API 5l X52 Carbon Steel Pipe. STI is India's Award winning exporter of Steel Pipes & Tubing. Visit our about us page to view Best Export Award Winner Trophy & Certificate. STI is PED-97/23/EC certified company and Government of India recognised star export house. Looking for API 5L X52 Pipe supplier in Singapore? We are a trusted API 5L X52 Pipe suppliers in India and export to Singapore, Malaysia and UAE regularly since 1994 and 80% of our customers are repeated customers in Singapore & UAE. Call us today to get our client list so you can find our client near you and can take the reference of oup Pipes quality, price & delivery commitment. Steel Tubes India is one of the most preferred Manufacturer of API 5L X52 ERW Pipe in India. For Seamless we buy from Japan, Italy, France & South Korea. We only stock and supply Certified material with Mill test Certificate. API 5L Grade 52 is produced in ERW, LSAW, SSAW and seamless forms in Size from 1/2 " to 60 inch. Yield Strength of API 5L X52 pipe or L360 Line Pipe is 360 Mpa. This grade is medium grade of API 5L and ISO 3183 specifications. Tensile strength of this grade is 66700 Psi and 460 Mpa. the tensile strength and yield strength of X52 seamless pipe or welded Pipe is same. In API 5L grade X42 content of C 0.28%, Mn 1.4%, P 0.030%, S 0.030%, V+Nb+Ti ≤ 0.15%; Copper content is 0.50%, nickel is 0.50%, chromium is 0.50% and Molybdenum is 0.15%. As Govt. recognised exporter & API 5L X52 Pipe suppliers in India, we are offering API 5L X52 PSL2 (ISO 3183 L-360N) OD 20" pipe at special Price due to surplus stock, to know the Pipe make and MTC mail us to stindia@stindia.com. Also check price list of seamless steel pipe: 21.3mm - 660mm, 1/2" - 26" and Welded ERW pipe: 21.3mm - 508mm, 1/2" - 20", Call us today to know the cost of LSAW and SSAW pipe: 406mm - 2500mm, 16" - 100" which is also in ready stock. Check our Price and Documents of Pipe with actual images of pipe in Stock year before buying Grade 52 material from India or China. STI Supply EN 10225 S355 G15 Norsok Y22 material. Click here for API 5l x52 pipe sizes. Scope Covers Welded, ERW and seamless pipe mostly used to conveying water, gas and oil in both the oil and natural gas industries. API 5L X52 pipelines for combustible fluids. Suitable to use in maximum operating pressure over 16 bar. *Approx Price (USD/Ton). Please contact for final price list. Steel Tubes Ondia is a leading independent API 5L X52 Pipe exporter from India. STI has been a trusted vendor as a API 5L X52 PSL1 / PSL2 Pipe distributor & dealer in your country.